Following up on findings that are noncritical but actionable can be a challenge for any health care organization. Typically, follow-up is a manual process that requires logging results and making phone calls, but manual processes tend to be inefficient. Many large health systems have encountered malpractice and litigation issues due to incomplete clinical or imaging follow-up. To help automate follow-up of noncritical actionable findings, researchers at the University of Pennsylvania created the Automated Radiology Recommendation Tracking Engine (ARRTE). The ARRTE system combines natural language processing (NLP) and structured report templates to mine data from radiology reports and store them in a dashboard. Tessa S. Cook, MD, PhD, an assistant professor of radiology, chief of 3D and advanced imaging at the Hospital of the University of Pennsylvania in Philadelphia, and a member of Radiology Today's advisory board, says this hybrid approach achieves a higher patient capture rate than NLP alone. To compile the data, the researchers—Cook and coprincipal investigator Hanna Zafar, MD, MHS; developers Darco Lalevic and Christopher Pizzurro; and department chair Mitchell Schnall, MD, PhD—asked radiologists to use a structured template and commit to follow-up recommendations, a process that became a required component of daily practice. They were also asked to provide information about the modality and the timing of the imaging study. Reports that were identified as missing a structured template or important components were sent back to the radiologists with a request for addendum to determine whether patients should remain in the follow-up queue. The original structured template component of ARRTE was launched on July 1, 2013. Since then, the researchers have piloted other types of notifications, such as e-mails and electronic messages that are generated by ARRTE and sent within the EHR. Cook says the EHR component, which is available to physicians and nonphysician providers who refer to radiology, will soon go live throughout the entire health care system. The EHR messaging feature allows ARRTE to ask ordering physicians about a patient's status, such as why there isn't a completed study accompanying a recommendation, whether a radiological finding was previously known or is relevant to treatment, or whether a patient's status has changed. Cook says follow-up may be deemed unnecessary for a number of reasons. "By doing that messaging, we're able to reach out to the ordering physicians and ask if follow-up is clinically indicated," Cook says. "If they think the answer is yes, then they can go ahead and order it, and if they think the answer is no, they can at least communicate that back to us so that we don't keep sending unnecessary reminders." Cook says the first version of the system—the structured templates—was received well by primary care physicians, who want to know what test to order and when to order it. Specialists were not as enthusiastic. Many specialists felt that the patients were already being followed well and the doctors knew exactly what the patients needed. In addition, patients were reading the recommendations in their reports and asking the doctors about them, even when they weren't clinically relevant. "And so, because of that split in utility, particularly for the oncologists, who really felt like this wasn't adding to their practice, we split off the oncology population," Cook says. "There's a separate tracking system that we have for them that tries to document progression of existing disease or interval development of new disease, but they don't end up in the follow-up queue anymore because those patients weren't falling through the cracks." Along with making sure that patients don't fall through the cracks, one of the goals of ARRTE is to provide radiologists and other physicians feedback on the data that are being collected. Cook says it's difficult for radiologists to get feedback on their interpretations; referring physicians don't tend to come back and tell them whether their assessment was correct. The system has a physician portal under development that will allow radiologists to see whether a patient was downgraded, upgraded, or whether the patient's status is indeterminate. It will also allow them to do basic research, such as counting the number of indeterminate lesions on pancreas studies that a radiologist reported compared with his or her colleagues. "[ARRTE] has immense educational value for us, which you don't get as much after you finish your residency or fellowship. When you're a trainee and you read an interesting case, your attending tells you to write it down and make sure you find out what happened to that patient. 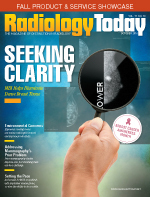 Once you become the faculty member or you become the private practice radiologist, the volume of images that you see is prohibitive for writing down cases and looking them up later," Cook says. "That's one of the things I'm really looking forward to having our developers build so that we can all start to learn from the way that we practice and learn about the ways we practice." Cook also hopes to add more comprehensive analytics to the system, similar to what has been done with BI-RADS, but that type of capability requires larger data sets. As more reports and images are uploaded, ARRTE and radiologists will be better able to draw conclusions from the data. — Dave Yeager is the editor of Radiology Today.